Each year throughout North America thousands of wild animal skins are thrown out because there is little commercial use for wild hides. Because the supply is limited to the hunting season, tanneries cannot generally afford to take on the processing. 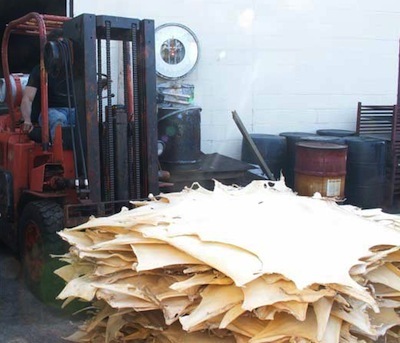 There is also increasing pressure on North American tanneries because of our strict environmental protection policies , while there are virtually none in off-shore tanneries. We have found a local canadian tannery that was willing to tan them for us and we offer them to you through our creations. Our drum include: a old fasion steamed/bent white ash drum hoop, one deer circle (large enough to go up and over the back of the frame), we punch the holes, perfect lacing enough to pull the drum and build a handle similar to our design. We will even email you some tips so that you can lead your own drum making workshop. 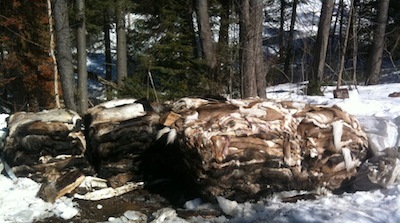 During the 2011 hunting season, we gathered about 1500 deer and 800 moose hides which would have been thrown out. We live in a region of Quebec where people have been hunting for centuries, and still hunt the local wild animals to feed their families. These animals were not wasted in any form. We then carefully salt them to prevent rotting before the tanning process. We then pile them on wooden pallets and, at the end of the season, we ship them via transport to a wonderful tannery. About 6 weeks later, we gather the fruits of our labour. Generally, we get one half processed into raw hide for our drums and the other half tanned into leather for our creations and for sale to our customers. Because we are working with our own recuperated hides, we have a greater control over the quality of our product. Good powwow drums require very thick hides to get the best sound. To achieve this, we sort through our gathered moose hides for the thickest ones to use on our powwow drums. The same goes for our moose sweat lodge hand drums. (Moose hide is used for sweat lodge drums because it is much more resistant to the humidity of the sweat lodge.) These are specialty drums and need a thin moose hide. A normal moose hide will twist and destroy the frame of a hand drum when it dries.